Paul and his experienced team will have you on the edge of your seat with demonstrations from the Sky Aces in their Wolf Pitts Pro and Model 12 Pitts, as well as demonstrations in a T28 Trojan, Yak 52, Grunman Avenger, Spitfire, Wirraway and many more. This year, he will also be showcasing a CA-18 Mustang and his latest aerobatics. 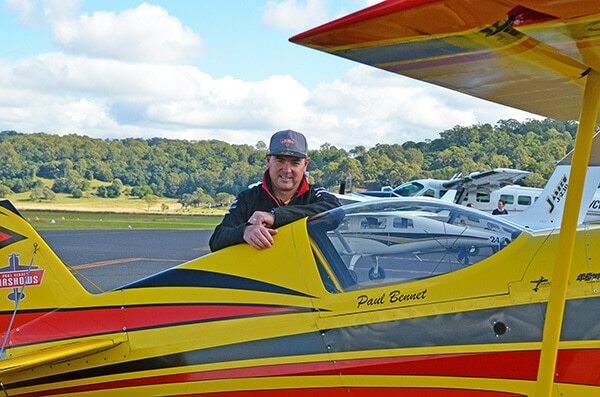 Paul launched his business Paul Bennet Airshows in 2005 and is now involved in over 30 events nationally and internationally each year, operating over 10 aircraft and employing five of Australia’s top air display pilots. His company is now the largest aerial entertainment business in Australia and the headline feature for the 2018 Lismore Aviation Expo. “Building this business has helped bring world-class aerial displays to rural Australia and at the same time inspired a new generation about a future in aviation,” Paul said. The fourth annual Lismore Aviation Expo is coming up on Sunday, 29 July with high-flying demonstrations, activities, displays and fun for all ages. Presented by Fast Aviation, the Lismore Aviation Expo has something for everyone, whether you want to brave the skies in your very own joy flight or stay on land and watch Paul and his talented pilots in action. For those with a lust for adventure, choose from a range of joy flights and learn-to-fly discovery flights including an exhilarating ride in WWII Warbirds. On the ground there will be static aircraft and emergency services displays, market stalls and activities for kids plus a range of food trucks and refreshments. This year organisers will also launch ‘The Mound’ – a new VIP viewing area where visitors will get a bird’s eye view of the runway. Entry to The Mound is by gold coin donation with all proceeds going to Our Kids. The Lismore Aviation Expo is on Sunday, 29 July from 9am to 4pm at the Lismore Aviation Centre in Three Chain Road, South Lismore. Entry is $5 with children under 16 free. Please note there is no parking at the expo site (except for those carrying a disability parking permit), however shuttle buses will run continuously throughout the day from 8.45am, picking up at Oakes Oval in Dawson Street, Lismore Lake and Lismore Airport. The buses can carry prams and the wait between pick-ups should be no more than 15-20 minutes. For more information on the expo and highlights of the day, or to book a joy flight for you and a friend or loved one, visit www.visitlismore.com.au. Please note: All aircraft availability is subject to operational and weather conditions. Image: Paul Bennet and his team with be one of the highlights at the 2018 Aviation Expo.